and Department Chairs from throughout the county. Community service opportunities in Rockland that relate to history wre suggested and discussed. For community service opportunities, click on the PDF flier below. 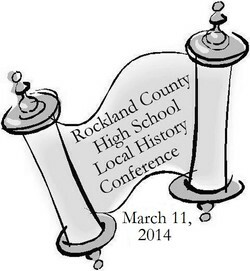 YOUR support of the 2014 High School Local History Conference enables the HSRC to meet its mission to share history with the people of Rockland County. Donation are tax-deductible to the full extent of the law. April 9, 2013, from Dorice Madronero on Vimeo.